For me, when I read a book from a parent, I don’t want to hear them glorify themselves. I want to hear about their struggles and the uglier moments of parenting. Parenting has many wonderful moments, but getting to those wonderful moments isn’t an easy road. It is a road filled with mistakes and detours. 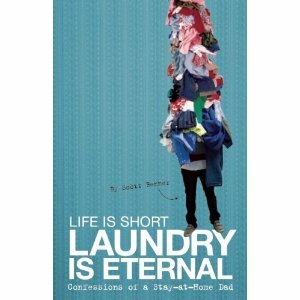 Scott Benner’s book, Life is Short, Laundry is Eternal, is a book that proves that the family route is one that is paved with bumps and washed with tears, but filled with fun and love. Although I’ve never met Scott Benner, I felt a sense of community after reading his book and immediately hoped for a sequel. Like Mr. Benner, I am a stay-at-home dad and have gone through many of the situations and feelings that he has faced. I felt so connected with this book that I was certain that my name would be found in his acknowledgements. From the first page, I knew that he and I are swimming in the same bottomless laundry basket. I was riding in the car while reading the book, and had to read out loud to my wife, “There is no more thankless task than making another’s clothes clean again.” The truest thing to ever be written. Cleaning house and picking up after family members is one of the many difficult tasks of being an at-home parent and he captured those difficult and gross tasks beautifully. Benner tackles gender stereotypes, discussing the many mothers who have stayed home and taken upon thankless tasks and encouraging men not to view chores as women’s work, but to share the load themselves. “There is no such thing as gender specific when it comes to being a part of your family.” As I read those statements, I could hear rallying cries from the parental mountaintops. There are many great examples in the book of what a stay-at-home parent faces daily, and the journey that took him from being a normal guy in his 20s to an involved dad. That journey was not always smooth, and Benner shares deeply personal moments and how they’ve shaped him, like when his adopted father walked out on him on his 13th birthday. “The lesson I learned that day was simple. I never wanted to be a man who could or would make his family feel as awful as he made us feel.” His world was turned upside down again when his daughter was diagnosed with Type 1 diabetes. This is not only a great book about being a stay-at-home dad, but it is also a wonderful book about parenting generally. The stories and anecdotes guide you through what it is like to love and care for a child with a serious illness, and then lift parents with encouragement and hope, whatever the parenting challenges they face. The road to being a good parent isn’t glamorous, and thankfully Mr. Benner is honest and open enough to show us that you can make those mistakes and, with the right sense of humor and desire to learn, still come out on top. You can follow Mr. Benner on Twitter @Ardensday and can follow his blog at www.ardensday.com. Great review. I gotta check this book out. Thanks. I really enjoyed reading the book. It captures what a stay-at-home dad is like. Thank you for the wonderful review Jason… I’m so happy that you enjoyed my book. Thanks for writing it. You really did capture the stay-at-home dad voice.